Developer & Publisher: Her Interactive Inc.
A few years ago, while on a cross-country airplane trip, I had the occasion to play Nancy Drew: Stay Tuned for Danger on a laptop. I found it a pleasant diversion, though it was not a game that “wowed” me or that called emphatically to be finished once I tucked away the laptop. I had been a Nancy Drew fan in my youth. Now, however, I confess that I remember the book covers a lot better than the text between the covers. So it is essentially as a Nancy Drew novice that I entered the world of Last Train to Blue Moon Canyon. Ms. Drew has come a long way since the earliest games and the original books. Last Train to Blue Moon Canyon opens with a letter from Nancy to a friend. Nancy has finessed her way onto a train heading out West. The train is the property of Lori Girard, a young, blonde celebrity (the sort of person who is famous for being famous). Lori has extended an invitation to the Hardy Boys, as well as to a celebrity police detective, a ghost hunter, and a writer of historical romances. These people will travel out West with Lori to solve a mystery presented by the former owner of the train – wealthy adventurer Jake Hurley. Jake had purchased the train in the 1870s so he could participate in the Gold Rush in cushioned, well-supplied comfort. Years later, after his young wife’s death, Jake Hurley disappeared. The train was subsequently discovered stopped dead on the tracks with the engineer also dead, apparently of a heart attack. It’s no surprise that the train acquired a reputation for being haunted. Lori Girard has gathered these people together to try and locate the reportedly fabulous riches in Jake Hurley’s lost mine. There are clues throughout the train, left there by Jake to be discovered after his death. Shortly after Lori explains this challenge to her assembled guests (among them the party-crashing Nancy Drew) the train goes through a tunnel, the lights flicker into darkness and the guests realize that their hostess has disappeared. Has Lori been kidnapped? Has the ghost of Jake’s dead wife spirited her away? Is she indulging in yet another publicity stunt? We’ll soon find out, because Ms. Drew is on the case! If she can solve the mystery of Lori’s disappearance, perhaps we will all be closer to discovering the mystery of Jake’s disappearance and the location of his fabled mine. Much care has been taken to give a sense of train movement as you speed through the night. You’ll hear the shriek of the train whistle and the sound of wheels on the rails. Patterns of light blink through the windows and flitter down the train corridor walls. Movement between cars feels realistically hazardous. The high resolution cutscenes in Last Train are quite effective. I wish there had been more of them. There’s a spectacular cutscene near the end of the game – a reward for solving several multistepped puzzles. 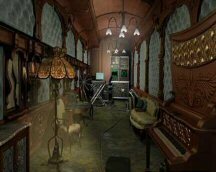 There is musical accompaniment to your exploration of the train, made up of short loops from various themes. Some of these – particularly the western themes – I enjoyed. However, you do hear them over and over, and one in particular – a slow, lyrical theme – quickly sounded rather worn-out to me. The best music occurs late in the game, during the suspenseful conclusion. Jake Hurley’s train contains a knotty collection of puzzles. You’ve probably experienced puzzle boxes – well, this is a puzzle train. Almost everything you see on the train is a clue. You’ll get a sense of the long-dead Jake’s genius/madness. Yes, he was crazy to think that anyone could piece these elaborate clues together, though Jake seemed to think it would be easy. Not surprisingly, until Ms. Drew happens along, the clues have been gathering dust. You’ll find a huge variety of puzzles in this game – some inventory puzzles, many pattern and sequencing puzzles, block puzzles, matching challenges, a mathematical scale puzzle, a word recognition puzzle, symbol interpretations, a board game, a couple of treasure hunts -- even a handful of easy, timed mini-games. Most of the challenges are just hard enough that they get you to think, but not hard enough that they stump you for hours (there was only one exception to this – a number sequence for which I still haven’t found a clue). There is also a cooking puzzle in the game. I had heard about such “practical” challenges in the Nancy Drew games, and was secretly dreading the necessity to have to face one, as I happen to be a terrible cook. However, I was pleasantly surprised by this particular cooking puzzle. Not only was it fun, it was funny. Bring on more cooking challenges! About halfway through Last Train to Blue Moon Canyon, you begin to see scenery from the world around you, the train reaches its destination, and you can finally leave the train and step out-of-doors. The first stop, Copper Gorge, is considerably less impressive than the train itself. Its best part is the fun it pokes at American-style tourist attractions, as exemplified in the “Copper Gorge Museum and Taffy Shop.” Along with historical “arteefacts” from Copper Gorge’s glory days as a mining town, you’ll see coffee mugs, T-shirts, arcade games, “MinRs Allowed” signs and boxes and boxes of taffy. The museum is supervised by a lifesize cartoon mascot with a western accent so outrageous that it surely took years of practice to master. This game does convey a sense of traveling out West. However, that out-West feeling could have been more effectively developed if the environments outside the train had been somewhat larger, or if more views of the Western landscape had been available as the train moved forward on the map. There is quite a lot of character interaction throughout Last Train to Blue Moon Canyon. The characters are well developed and fun to talk to. The voice acting performances are excellent, if not fine-edged – most of these characters are celebrities and have larger than life personalities. Two non-celebrities on the train (well, in the game they are non-celebrities) are the aforementioned Hardy Boys. Like the other characters, the Brothers Hardy function mostly as Ms. Drew’s advisers and conversational partners, rather than actual participants. (The one exception to this is the role-playing switch mentioned above.) Still, Frank and Joe Hardy do add a nice, “normalizing” dimension to the cast of self-absorbed publicity hounds on the train. Having previously assumed that the Hardy Boys would be antagonistic to Nancy (they are competitors in detection), I expected them to be, well, a couple of junior Philip Marlowes -- young men of few words and blunt attitudes. Instead, Frank and Joe are handsome, engaging, well-spoken and polite. They are the sort of young men who (as a any mother with daughters will attest) inspire the old-fashioned maternal desire to suggest an arranged marriage. There’s also the opportunity in Last Train to speak to two of Ms. Drew’s friends -- Bess and George -- who are not along for the ride. You can dial them up on Nancy’s cell phone; they provide commentary and colorful chatter. I feel that my newbie status in the Nancy Drew gaming universe was most problematic during these encounters with Bess and George, as I didn’t always appreciate or even fully follow the chatter. I’m sure that, had I gradually gotten to know them through other games in the series, Bess would have seemed considerably less silly. The character animation in Last Train is pretty good. Obvious care was taken with the lip synching. Body movements during speech (including shadows cast) are lifelike and give realistic emphasis to the dialogs. Facial animation is not as detailed, although this is largely compensated for by the characters’ gestures and the voice acting. Yes, you can suffer fatal failure in Last Train. In fact, it’s kind of fun to die in this game. Ms. Drew usually makes an insightful final comment (like “oops”), there’s a quick glimpse of Approaching Doom, and the screen goes blank. You then find yourself back at the main menu, where you can select “Second Chance,” which places you back in the game right before the fatal error. Last Train to Blue Moon Canyon installed and ran for me without a glitch. The interface is point-and-click, including a somewhat odd 360 degree panning feature in the center of certain rooms. Panning is only available in select locations – and you can’t tell it’s available until you start sweeping the cursor around the room. Then the cursor changes into circular arrows, and the game goes into a jerky panning sequence. I never did get used to this. The game contains a nice Tutorial that is helpful if you haven’t played the Nancy Drew games before. You can play on Senior Detective or Junior Detective levels. In the Junior Detective level, you are given a checklist that provides extra direction and hints, and you can dial up Bess and George on the phone for more detailed hints. The interface at the bottom of the screen contains a standard inventory apparatus, and a casebook/journal that keeps you up-to-date on what you’ve learned so far. In addition, Ms. Drew has recently acquired a camera phone with which she can take pictures, either to keep as a reference for puzzle solutions, or to submit to friends and family back home for analysis. This was only partially successful, as the camera screen is so tiny that it was virtually impossible to get enough in the picture to help with puzzles. Whose Demographic Is This, Anyway? All-in-all I had a highly entertaining journey on Last Train, much more than I had expected from my (admittedly) short experience with Stay Tuned for Danger. Now on the one hand, playing several of the other Nancy Drew games first would have added nuance to the Last Train experience. But on the other hand, this game is a great introduction to Ms. Drew and her world. I’m sure you will find longtime fans who will say the opposite, but my advice (if you haven’t played any previous Nancy Drew games) would be to start with Last Train because of its engaging story and its sumptuous graphical quality. Then work backwards through the series. I thought this game was perfect for preteen and early teenage girls, and if I was grading it from the perspective of that demographic alone, I’d give it an A+. The writing, the graphics, and the multitudinous puzzles and challenges also make this a well-above-average game for adults (particularly adults who have fond memories of reading the Nancy Drew books). Still, it’s clear that design decisions were made for this game based on the assumption that a large chunk of the game’s audience would be young girls. When compared to adventure games that address a more general audience, Last Train has fewer environments, spends more time with traditionally female preoccupations (dolls, samplers, dancing steps), and contains portions of dialog that are clearly of more interest to young females than to anyone else. First person point-and-click mystery game featuring the famous girl detective. The Hardy Boys also come along for the ride. Two levels of gameplay. Unlimited save slots. Subtitles available. A very generous collection of different kinds of puzzles, including inventory and sequencing puzzles. Easy timed, mini-games. No sliding tile puzzles, one music puzzle that’s really a symbol interpretation puzzle, one maze-like challenge. A large percentage of the puzzles require you to discriminate colors. Plenty of character interaction, excellent voice acting. Gorgeous Victorian interiors on the train. A lighthearted sense of humor in much of the game, but the game does touch on themes of betrayal, death, and the tests of character that wealth and celebrity status can bring. You can die in the game, but the “Second Chance” option brings you right back to the point before your fatal error. No glitches. No problems with installation. Nancy Drew: Last Train to Blue Moon Canyon is aimed at Nancy Drew fans, Hardy Boy fans, and adventurers who enjoy a variety of puzzle challenges while solving mysteries in eye-catching historical surroundings.